Wow! The market's ups and downs are getting more violent and the time frame of the moves are getting more compressed. When I wrote last Monday that the markets looked a little overbought and that it was maybe time for a little pullback (see Time for one step back? ), I never expected the severity and speed of the downdraft. On Wednesday, I had remarked to a friend that things looked a little overdone in Europe. The sense of panic was evident. 17 leading economists publicly warned that Europe was sleepwalking toward disaster. Tim Duy, who I regarded as relatively level-headed, rhetorically asked if there is even a panic button in Europe. Little did I know Draghi's pledge to do "whatever it takes" to save the euro was imminent. Nor did I expect that we would move from a short-term oversold condition Wednesday on one of my trading models to a near-overbought reading by the close Friday. The bulls were encouraged Friday when the SPX staged an upside breakout past a key level of technical resistance on decent volume. Does this mean that the bull and bear tug of war is over and the bulls have won? Not just yet. When I reviewed some of my secondary indicators on the weekend, they hadn't quite confirmed the bullish breakout staged by the SPX. Consider, for example, the relative returns of SPY vs. TLT (US long Treasury ETF) as an indicator of the risk-on vs. risk-off trade. As of Friday's close, this relative return ratio remains in a trading range and has not confirmed the bullish equity breakout. The same non-confirmation can be found in the relative performance of defensive sectors, such as Consumer Staples against the market. As of Friday's close, Consumer Staples remain above a relative support level and has not broken down, which would indicate that the bulls had taken control of the stock market. Similarly, the relative performance of Utilities (not shown) also shows a similar pattern of holding up above relative support. Moving across the Atlantic, where ECB chief Mario Draghi sparked the risk-on rally, the chart of the Euro STOXX 50 is still struggling to rise above resistance. In addition, while the yields on Spanish and Italian bonds have fallen, they have not fallen sufficiently for me to wave the all-clear signal. More of the step-forward, step-back shuffle? I wrote several weeks ago that we remain in a choppy market and I am waiting for some definitive signs of either strength or weakness before I would want to make a directional call (see Waiting for direction). While the bulls won a battle Thursday and Friday, they haven't won a decisive victory yet. To be sure, there are good reasons to be relatively sanguine about the outlook. China seems to be turning around, as evidenced by the better than expected HSBC flash PMI last week; Mario Draghi has taken the risk of Eurogeddon off the table, as least for now; and the American economy appears to be stabilizing, or at least it's not going over a cliff. 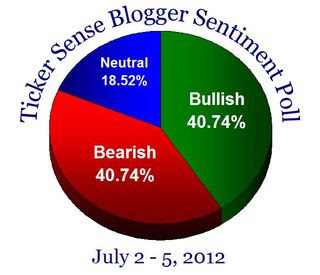 Even though I am cautiously optimistic about the stock market, my official vote in the Ticker Sense blogger poll remains neutral. Until I see some signs that the bulls can break through and take control, my base case remains that of a market dancing the step-forward and step-back shuffle, though I may be tactically inclined to either increase or reduce my portfolio beta. Wash, rinse and repeat. What if the RMB were to fall? Currency appreciation continues to be an important component of the package of reforms needed to transform China’s economy. A stronger renminbi would increase household purchasing power, help expand the service and other nontradable sectors, boost the labor share of income, and facilitate financial sector reform. The recent widening of the intraday trading band is an important step in this regard, as it will allow the market to play a stronger role in determining the exchange rate. Using this increased flexibility would also have the benefit of allowing for a more independent monetary policy. As reserves are well above all standard metrics and the currency is moderately undervalued, the real effective exchange rate should be allowed to continue appreciating by reducing intervention over the medium term. 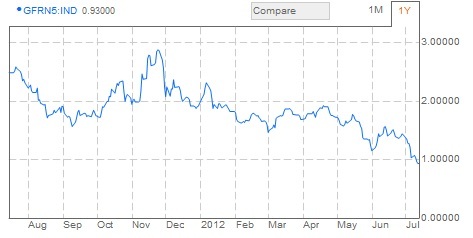 This view of the CNYUSD exchange rate equilibrium represents conventional wisdom. China's currency is slightly undervalued against the Dollar and she needs to continue to take incremental steps to bring the exchange rate into fair value. Emerging economies face capital outflows. Between 2009 and 2011, low interest rates in developed economies sparked massive flows of hot money into emerging economies. The hot money fueled asset inflation and spiced up economic growth too. The latter gave the perception of emerging economies decoupling from developed ones and incited even more inflow. The asset inflation eventually sparked general inflation, which slowed economic growth and diverted money from asset markets. The resulting asset deflation further decreases economic growth. Hot money is now leaving because it sees the unsustainability of the growth dynamic in emerging economies. The Indian rupee and Brazilian real have declined by one-fifth from their recent highs, reflecting pressure from capital outflows. Because China has a controlled exchange rate, the outflow has come later, as investors believed in the safety of a government-supported exchange rate. The weakening economy this year appears to have sparked expectations of yuan depreciation. The government support of the exchange rate has become an accelerator for capital outflow, as it is increasingly viewed as a subsidy for early leavers. A while ago, we dared to suggest that a new trend was emerging in China’s foreign exchange operations. Instead of being a net buyer of foreign currencies from the market — and conducting monetary policy operations in line with that position — the Chinese state was becoming a net seller of foreign currencies onto the market, and adapting its monetary policy accordingly. A natural outcome of there not being enough foreign currency inflow into the country. But also of yuan outflows, and fears that the yuan may depreciate more generally. Let's suppose that Washington got it want from the Chinese in the form of greater exchange rate liberalization, but instead of rising against the USD, CNY fell instead. How would Congress react? Two perspectives on the "French lion in the grass"
We can all see the lions, large and small, of Greece, Portugal, Ireland, Spain, Italy, and now Cypress and Malta. The fear of contagion is what keeps European leaders up at night, trying to figure out how to keep Spain afloat. Because if Spain sinks, the focus immediately turns to Italy. But enough of the lions we can see. Don’t look now, but the lion that lies hidden in the grass is France. Yes, the France that is supposedly a big part of the solution to eurozone woes and Germany’s stalwart partner in guaranteeing all that debt. AAA France. Rated that way by the same people who turned the nuclear waste of subprime CDO squareds, composed 100% of the worst sort of BBB junk, into gold. Now, the rating agencies are using the same alchemical Philosopher’s Stone to transmute French debt into … fool’s gold. Today, investors are lending to the French state for five years for less than 1% and its 10-year yields are at all-time lows, presumably it has been lumped in with the likes of Germany as being a safe haven, the French fiscal outlook is dire. In particular, he pointed to an IMF study (actually, I believe that it was a BIS working paper called The future of public debt: prospects and implications). The study examined the debt to GDP path of various major industrialized countries and Mauldin observed that the French debt trajectory look the most like Greece. Yes, the country most like France is Greece. Yes, THAT Greece. The one that just defaulted. The one that everyone agrees is dysfunctional. Also notice that if Greece were to follow the suggested draconian path, it could stabilize its debt. And then notice that if France were to make the same level of draconian cuts, its debt-to-GDP ratio would merely rise to almost 200% within 25 years. Oops. I have two reactions to that analysis. My inner investor says, wow that's terrible. France is an accident waiting to happen. French debt costs will surely blow up and investors need to re-examine the credit risks of any debt paper that they consider. If French yields were to surge because of some event, then risk premiums will also blow sky high and that won't be good at all for the risk-on trade, i.e. stocks, commodities, etc. My inner trader tells me that, under the current circumstances, French real interest rates are negative and the France is actually making a profit by running these deficits. It has zero incentive given market conditions to rein in its deficits. In fact, it should be taking advantage of current conditions to extend the maturity of its debt structure in order to lock in low rates. It's important to be aware of the long-term risks of the French fiscal path, these kinds of things have a way of not mattering to the market until it matters. As a trader who is measured by the bottom line in his portfolio, he has to be aware of the risk but not hide in the bunker and act on this "lion in the grass" until the lions starts to move. You have to watch for the inflection point. These differing viewpoints certainly put the Merkel/austerity vs. Hollande/stimulus debate into a fresh perspective. Time for one step back? Last Monday, I wrote that markets were choppy, volatile and lacking in direction (see Waiting for direction) and I was waiting for a technical breakout, either to the upside or downside. Despite the upward bias shown by the stock market last week, I remain convinced that equities remain in a trading range. In that case, the coming week might be a opportunity for stocks to take one step back. These days, the way to think about global markets is to think about how the Big Three are behaving, namely the US, Europe and China. In the US, a glance of the chart of the SPX tells the story. The market remains in an ascending triangle pattern, but was rejected at resistance on Friday. 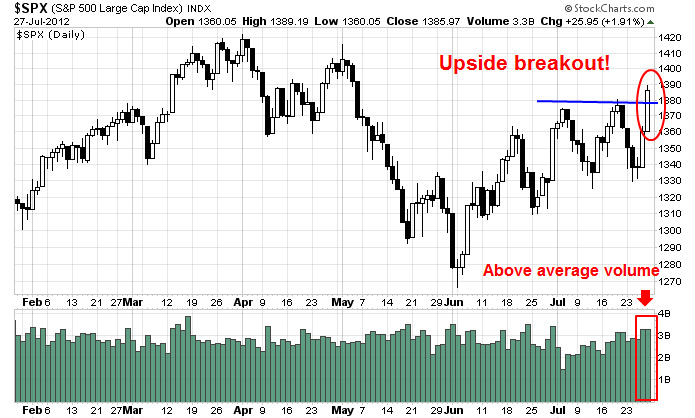 This suggests to me to expect some weakness, with downside support appearing at about the 1350 level. Across the Atlantic, the Euro STOXX 50 is showing a similar pattern of a rising wedge and ascending triangle. We have been seeing relatively good, or at least benign, headlines out of Europe. My instincts tell me that Friday's carnage may be the start of a negative news cycle. Then there is China. When I think about China, I could point to the bullish pattern formed by commodity indices, but they have been distorted by the weather driven rally in the grains. Instead, consider the price of Dr. Copper, which is displaying a pattern that is eerily similar to the previous two charts. I am also watching the AUDCAD currency pair. While the Australian and Canadian economies are similar in character in their resource exposure, Australia is more sensitive to Chinese demand while Canada is more sensitive to American demand. The AUDCAD staged a minor breakout last week. Will the breakout hold? In short, the risk-on trade appeared to have hit some kind of collective resistance level and may be in the process of pulling back. How it performs in the coming week will give further clues of whether the bulls can make a stand or if we are back to the same-old-same-old of choppy and direction-less markets. In my post last week about China (see China beyond the hard/soft landing debate), I wrote that one of the side-effects of the CNYUSD peg was an inappropriate monetary policy, which served to coddle the State Owned Enterprises (SOEs) at the expense of the Small and Medium Enterprises and the household sector. Not so coincidentally, Party cadres and insiders have made out like bandits as the power of SOEs have grown. While the central government's stated policy is to re-balance growth away from big ticket infrastructure spending toward household spending, such a policy is unlikely to get implemented because it gores the Party insiders' ox. The conclusion that I came to was that, when faced with the prospect of a slowdown, China's leadership is likely to panic and implement another round of stimulus which would lead to another round of unbalanced infrastructure induced growth, despite its stated policy of trying to re-balance growth toward the household sector. That's precisely what seems to be happening. Outgoing Chinese premier Wen Jiabao warned last week that the "country’s economic rebound is not yet stable and economic hardship may continue for a period of time". That statement prompted speculation that we would see another round of stimulus. Wen is focusing on homegrown methods to boost growth, such as promoting domestic investment. This strategy risks repeating the excesses of the 4 trillion yuan ($586 billion at the time) stimulus package of 2008, which fueled inflation, pushed credit beyond sustainable levels and led to a property bubble. It also favors large, and often inefficient, projects by state-owned enterprises over small and medium-sized companies: Witness the government’s decision in May to approve an $11 billion steel plant, for an industry in which there is already excess capacity. Full-year spending will be 448.3 billion yuan ($70.3 billion), according to a statement dated July 6 on the website of the National Development and Reform Commission’s Anhui branch. The document indicates a 9 percent increase from a previous plan of 411.3 billion yuan. Spending was 148.7 billion yuan in the first half. China’s fixed-asset investment has already started to pick up and a jump in spending on railway construction would echo the expenditure on rail lines and bridges that was part of stimulus during the global financial crisis. A decline in foreign direct investment reported by the government today underscored the toll that Europe’s debt woes and austerity measures are taking on Asia’s largest economy. 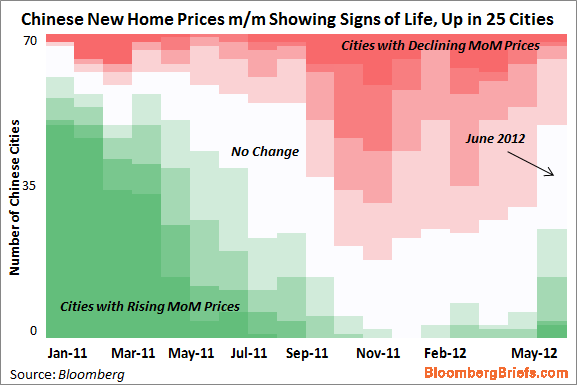 In the meantime, China's property prices are seeing signs of a turnaround. 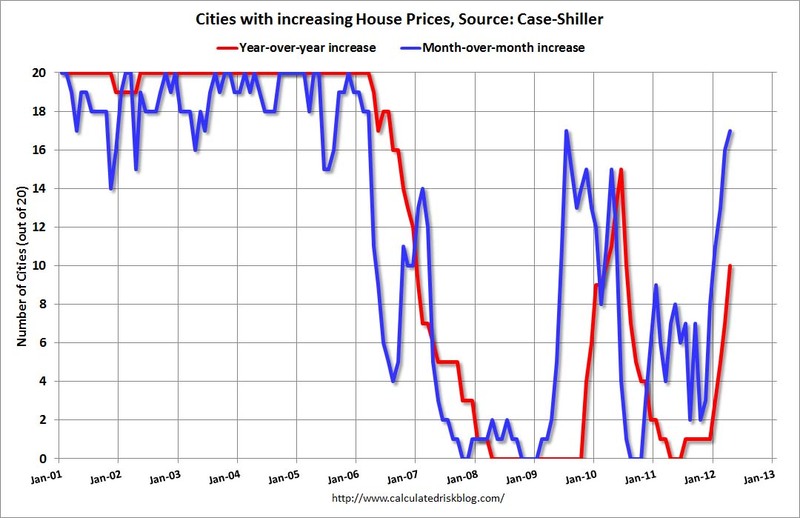 All this is happening while the government's stated goal is to restrain the effects of the property bubble. But faced with economic weakness, the reaction is to spend more money on steel mills, railways and to allow property bubble to reflate. In the short term, this is good news as it means a soft landing is in the cards for China. In the long term, more unbalanced growth means that when the next real downturn hits, the authorities may not have sufficient resources to cope with its effects. I worry that in the down leg of the next cycle, we may see a crash landing - defined as negative GDP growth from China. That's a prospect that's not in anyone's spreadsheet model. This stock market has been a difficult one for traders and investors alike. The directionless choppiness has combined to create a climate of maximum frustration for many professionals that I have talked to. Unfortunately, the volatility is likely to continue and I am still waiting for signs of direction. For a market analyst, the bear case is easy to make. Cyclical leadership is weakening and defensive leadership continues to be dominant. Consider the chart below of the relative performance of Consumer Discretionary (XLY) against the market (SPY). This sector, which had been the leadership close to two years, has declined through a relative performance trendline, which indicates faltering relative strength. The relative performance of the Morgan Stanley Cyclical Index tells an uglier story. Cyclical stocks remain in a relative downtrend against the market, with no bottom in sight. If there is an economic rebound, then it should show up in this sector. This weakness is confirmed by recent downbeat comments by Warren Buffett, where he indicated that, across a range of Berkshire's businesses, growth was decelerating. The Technology sector continues to look sick. The chart below shows the relative performance of the equal weighted NASDAQ 100, which takes out the strength of heavyweights like Apple, relative to the market. In the meantime, defensive sectors such as Consumer Staples continue to lead. Investors have also gone wild for yield, which has pushed up the relative performance of Utilities. This sector appears to be consolidating its relative gains after a period of outperformance. In addition, Mark Hulbert reports that insiders are selling more than normal, which is bearish. The macro picture is full of risks. China is slowing and is at risk of a hard landing. Europe isn't resolved and the US, as shown by the analysis above, appears to be slowing in the face of the upcoming fiscal cliff. On the other hand, I wouldn't be too eager to get overly bearish here. Long-term sentiment measures are screaming "buy". 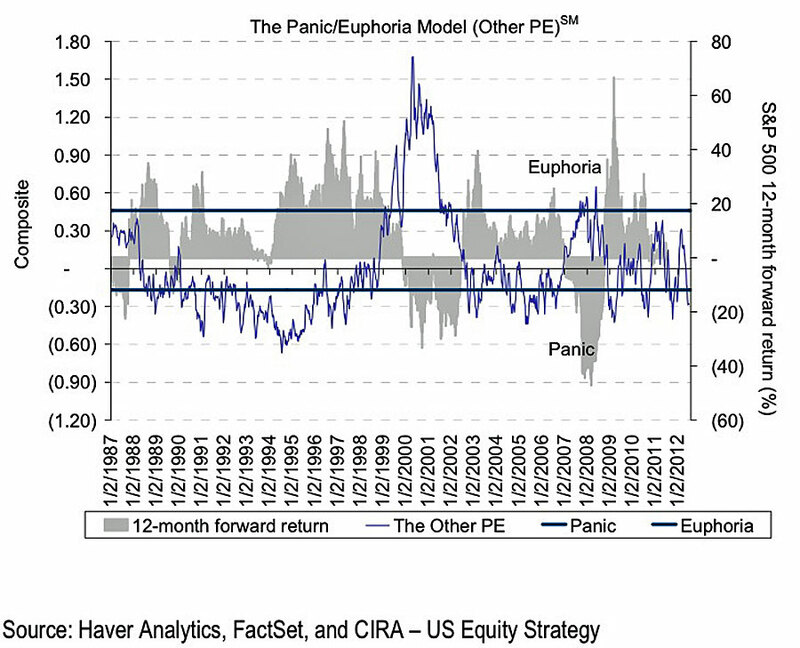 Citigroup's Panic-Euphoria indicator (via BusinessInsider) is flashing a panic signal indicating a 97% chance of a rally. After triggering a Buy signal in May, our measure of Wall Street bullishness on stocks declined again, marking the ninth time in eleven months that the indicator has fallen. The 0.8 ppt decline pushed the indicator down to 49.3, the first time below 50 in nearly 15 years, suggesting that sell side strategists are now more bearish on equities than they were at any point during the collapse of the Tech Bubble or the recent Financial Crisis. Given the contrarian nature of this indicator, we are encouraged by Wall Street's lack of optimism and the fact that strategists are recommending that investors significantly underweight equities vs. a traditional long-term average benchmark weighting of 60-65%. In fact, the safe haven trade looks awfully crowded here. I know there have been lots of voices calling for a Treasury bond bubble, but consider how far the safe haven trade has gone: France, which less has not been a model of fiscal restraint but got lumped in with Germany by the market, has its 5-year paper yielding less than 1%. 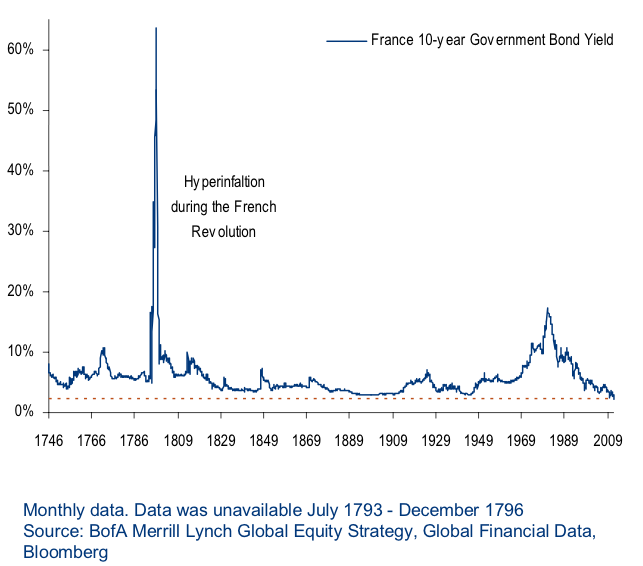 In fact, 10-year French yields are trading at all-time lows in a history that stretches back to the 1700's. With long-term sentiment models showing this much bearishness, traders who go short run the risk of getting their faces ripped off in a market melt-up on any hint of positive news, as they did Friday. I am starting to see signs of stabilization. Despite the huge macro risks overhanging the eurozone, the EURO STOXX 50 has staged an upside breakout from a downtrend and appears to be trying to put in a bottom, which indicates that the worst may be over. Commodity prices, which are highly sensitive to China's growth outlook, also appear to be bottoming. I have had comments from readers that the rise in commodity prices may be related to the rally in the grains, which is weather related. A look at the price of Dr. Copper, which is not weather sensitive, also shows a similar pattern of stabilization. Long-term investors may be tempted to get long here, but I would also caution against going all-in because we have not seen signs of investor capitulation yet. In the most recent bout of market weakness, a broker contact I had told me that clients were calling up to ask, "Is it time to buy yet?" These are not signs of a durable intermediate term bottom. My indicators of asset relative performance are not showing signs of a wash-out in sentiment either, though they are getting close. This chart of the relative performance of SPY against TLT, which represents long Treasuries, is getting close to panic levels, but not yet. Similarly, a longer term chart of Canada's Venture Exchange Index of junior stocks against the more senior TSX Composite is telling the same story. Getting close, but we need a bit more pain. Moreover, the upside for the bulls may be limited. We have been in a range-bound market since the NASDAQ peak in 2000. If the trading range were to continue, then the upside potential for the bulls may be limited at these levels. In short, this has been a market of maximum frustration. My inner investor is accumulating positions, but he is afraid that we could see a downdraft on some dramatic news that could take the market down 20%. My inner trader doesn't know what to do. His instincts tell him to get short, but the risks of a rebound are too great. He is mostly stepping aside and waiting for market developments to give him an indication of direction. Imagine a country where a sector has dominated that nation's economy and is deemed to be "systemically important" to growth. Insiders of that sector have made obscene profits from the growth. One day, we wake up and find that that sector has gotten in over the heads. The "logical" free-market solution is the let that sector go down and allow the economy to re-balance, but sector insiders have a cozy relationship with the government. If leading companies in that sector goes down, the collapse will surely take many in government down with them. What country am I referring to? What sector? What is the most likely course of action for the government? One obvious answer to the first two questions is the finance sector in the West (see my last post Another test of the banking lobby's powers). It's a good guess, but I am referring to State Owned Enterprises (SOEs) in China. While the currency peg allowed Chinese labor to be highly competitive, it also created all sorts of nasty side effects. First and foremost, China was stuck with America's monetary policy, which was inappropriate for China. As the Chinese economy heated up and inflation rose, Chinese interest rates could not rise with inflation and inflationary expectations because of the currency peg. Thus, real interest rates went negative. Negative real interest rates created winners and losers. The winners were the companies with easy access to capital, which were mostly the SOEs at the expense of private businesses, which are often referred to as Small and Medium Enterprises (SMEs). An academic paper called A Model of China’s State Capitalism (h/t Michael Pettis) that shows that the dominance of SOEs and their superior growth is largely attributable to their monopolistic or semi-monopolistic positions in the Chinese economy, e.g. telecom, oil refining. etc. John Hempton called this arrangement a kleptocracy because Party insiders have become enormously wealthy at the expense of the ordinary citizen. Negative interest rates also meant very low or negative cost of capital. As Japanese companies found out in the late 1980's, it's easy to make money when your cost of capital is that low. You borrow as much as you can and invest in something, anything with a positive real return. If you are positioned properly, you can make obscene profits - and they did. 1.Explicit or indirect capping of, or control over, interest rates, such as on government debt and deposit rates (e.g., Regulation Q). 2.Government ownership or control of domestic banks and financial institutions with simultaneous placing of barriers before other institutions seeking to enter the market. 3.Creation or maintenance of a captive domestic market for government debt, achieved by requiring domestic banks to hold government debt via reserve requirements, or by prohibiting or disincentivising alternative options that institutions might otherwise prefer. 4.Government restrictions on the transfer of assets abroad through the imposition of capital controls. For those ordinary Chinese citizens who could afford it, the only logical place for savings is in real estate. Real estate became a form of money and savings poured into it. In effect, the CNYUSD peg was indirectly responsible for China's property boom. There are no widespread bankruptcies. The main reason for this is government-owned banks not foreclosing on delinquent businesses. Of course, banks may have more bad assets down the road, which is the cost for achieving a soft landing. State-owned enterprises (SOEs) reported 4.6% net profit margin on sales and 7.4% return on net asset in 2011. Both are very low by international standards. In the first five months of 2012, SOEs reported a 10.4% decline in profits but 11.3% increase in sales. SOE performance indicators are low and declining. This is despite the fact that SOEs have such favorable access to financing and monopolistic market positions. Closer observation gives clues as to why SOEs are so inefficient. Their fixed investment often costs 20% to 30% more than that for private companies and take about 50% longer to complete. The leakage through overpriced procurement and outsourcing and underpriced sales is enormous. SOE leakage can explain much of the anomalies in China. In addition to the problems presented by slowing growth, the financial system is teetering because of an over-expansion of the shadow banking system (see my previous comment Ominous signs from China). Left unchecked, it could have the potential for a crash landing, i.e. negative GDP growth, which is not in anybody's spreadsheet model. In the face of the cracks exposed by a slowing economy, what should the Chinese authorities do? The textbook answer is that growth has been overly unbalanced towards large infrastructure projects and tilt growth toward the household and consumer sector. The Chinese consumer needs to rise. The latest five-year plan specifies this objective in a clear fashion. The problem with that solution is that it gores the SOE and Party insiders' ox. For the household sector to rise, household income needs to rise. Wages need to rise. Returns to household savings need to rise. For this to happen, financial repression needs to end. Ending financial repression would mean that real interest rates would need to rise, which would squeeze the cost of capital of Chinese enterprises - SOEs in particular. Would the Party cadres go along with that? This may be a case of where the leadership dictates a course of action but the bureacracy doesn't go along. Under the circumstances, the most likely course of action is a "more of the same" stimulus program. Already, we have seen a surprise rate cut, which does nothing for the returns of the household sector. We are likely to see more infrastructure stimulus. Already, we have seeing signs of a growth revival and signs of real estate revival. The good news is that such a policy course will mean a soft landing in China. The bad news is that it will mean more unbalanced growth and it just kicks the can down the road. The next time the economy turns down, it will be that much harder to revive. What's more, such a growth path would mean the end of the commodity supercycle. The principal argument for being long-term bullish on commodities (which I have made before here) is rising household income in emerging market economies like China's mean rising resource intensity. Greater household income mean that consumers want more stuff, e.g. cars, TVs, etc. This is shown by this analysis from the Council on Foreign Relations. Nomura analysts Matthew Cross and Ivan Lee looked at China’s urbanisation rate and concluded that it can keep progressing at its current pace for years without needing an increased rate of steel consumption. In fact, they argue that China’s annual steel needs won’t increase at all in 2012 and 2013 — and that’s with new government stimulus. This is where I depart from commodity bulls like Jeremy Grantham. Even long-time commodity bull Jim Rogers has become more cautious on China. More importantly, while the world focuses on the China hard vs. soft landing debate, I am thinking about the longer path for Chinese growth. They will slow down. When the next downturn hits, we could see a classic negative GDP growth recession. The sums involved might have been huge. Barclays was a leading trader of these sorts of derivatives, and even relatively small moves in the final value of LIBOR could have resulted in daily profits or losses worth millions of dollars. In 2007, for instance, the loss (or gain) that Barclays stood to make from normal moves in interest rates over any given day was £20m ($40m at the time). In settlements with the Financial Services Authority (FSA) in Britain and America’s Department of Justice, Barclays accepted that its traders had manipulated rates on hundreds of occasions. ….banks will be sued only by those who have lost, and will be unable to claim back the unjust gains made by some of their other customers. Lawyers acting for corporations or other banks say their clients are also considering whether they can walk away from contracts with banks such as long-term derivatives priced off LIBOR. I expect the firms involved to face a locust swarm of litigation. Lawyers may accomplish what regulators and politicians refused to do: strip the banks of ill gotten gains and bring their preening CEOs and “producers” down a few notches. A day of reckoning may finally be coming. The post is well worth reading in its entirety. She wrote that gist of the problem is that mortgage servicers, either deliberately, or are sloppy by design, mis-process payments so that borrowers are flagged to be late and therefore the lender can tack on services fees. This makes the mortgage appears to be delinquent (if the borrower doesn't catch the mistake and complain) and that's an excuse for the lender to foreclose. Smith also documented mortgage documentation fraud where, for a price, a firm will fabricate whatever documentation is necessary for a lender to foreclose on a property. Barry Ritholz has also extensively covered this problem (see his foreclosure fraud linkfest here). At the heart of the problem is Ritholz's contention of Why Foreclosure Fraud Is So Dangerous to Property Rights. Now we have Barclays and the LIBOR manipulation scandal. We saw extensive litigation as a result the mortgage and foreclosure frauds, now we are likely going to see extensive litigation with LIBOR manipulation. Can we expect a result from the litigation where "regulators and politicians" couldn't or wouldn't do? The banking lobby made the mortgage mess go away for roughly $2,000 per loan. Will things get swept under the rug again? Admittedly, the mortgage scandal was in the United States and pitted the power of the financial system against the ordinary householder. The LIBOR scandal will be a test of strength in the UK, a different jurisdiction, between institutions. Any way you look at it, this will be another test of the powers of the banking lobby. But are mermaids real? No evidence of aquatic humanoids has ever been found. Why, then, do they occupy the collective unconscious of nearly all seafaring peoples? That’s a question best left to historians, philosophers, and anthropologists. Did someone ask under FOIA what environmental protection mermaids are accorded? Probably the same level of protection as Bigfoot or Sasquatch, I would imagine. In the post-war period starting from 1945, France and much of Western Europe experienced a virtuous cycle of rapid economic growth lasting thirty years called les trente glorieuses. Economic growth was driven by the combination of rising working age population, incomes and standards of living. This is known as a “demographic dividend”. America may be on the verge of its own trente glorieuses as it experiences its own demographic dividend, driven by the combination of a rising working age population as the children of the post-war Baby Boomers grow up and enter the work force and immigration. The American age demographic profile is substantially better than its major trading partners. Despite the angst over dependency ratios, or the ratio of workers to retirees, the expected increase in American workers means that American dependency ratios are likely to stabilize in the decades to come, whereas those of many other countries continue to decline – which will strain the pension system and national finances. What's more, America is attracting the right kinds of immigrants. 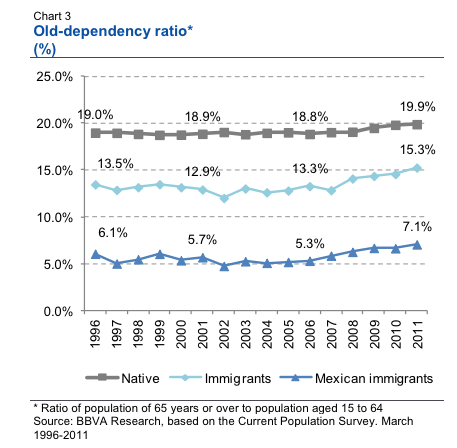 A recent report indicates that Asian immigrants now exceed Hispanics. Asians are an enormous attractive demographic, largely because they tend to outperform. 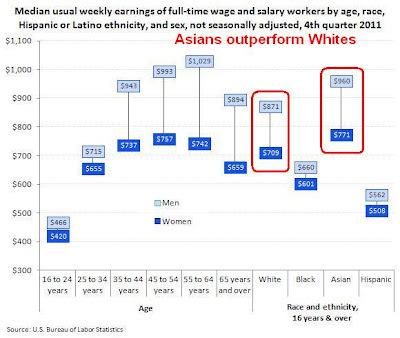 The latest BLS data shows (via Global Macro Monitor) that Asians are the top earning ethnic group and beat out Whites. The shortage of skilled labour in the Alberta oil sands and Saskatchewan potash mines has become a national issue. But a similar lack of people power is plaguing the ambitious but underdeveloped secondary cities of Ontario, and in Atlantic Canada a third of the population will be over 65 in less than two decades. The Conference Board of Canada estimates that over the next 10 years, there will be a million jobs going wanting across the country. This shortage is a drag on Canada's potential to innovate and compete into the future. On this 4th of July, this is indeed a note of optimism for America. Consider the average recommended equity exposure among a subset of the shortest-term stock market timers tracked by the Hulbert Financial Digest (as measured by the Hulbert Stock Newsletter Sentiment Index, or HSNSI). It currently stands at 47.0%. Particularly disturbing is that the HSNSI is now higher than where it stood on May 1, when the bull market that began in March 2009 hit what so far is its highest closing level. It’s five percentage points higher, in fact, even though the Dow is more than 400 points lower today than then. There are a few explanations for this discrepancy. The sample surveys of the two polls are different, which can lead to differing conclusions. Another explanation could be a difference in methodology. Hulbert measures the average recommended exposure, while the Ticker Sense poll just asks about direction, i.e. if you are bullish or bearish. 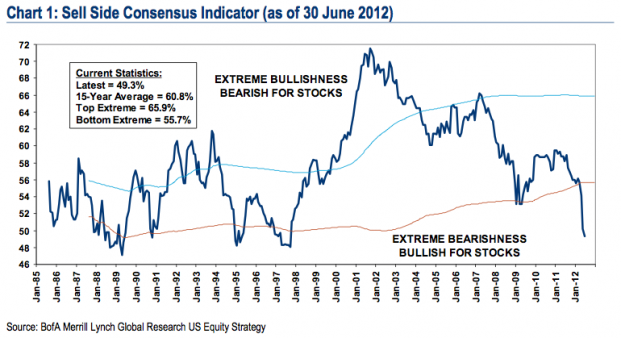 The bullish timers polled by Hulbert could be extremely bullish, while the bearish timers were only cautiously bearish. Such a result would skew HSNSI and pull the average up far more than "normally" warranted. Any way I look at it, this doesn't look like a case of excessive bullishness to me. Are market expectations too low? The market expectations going into the European summit last week was extremely low. When the leaders of Europe announced the usual plan to have a plan, the markets surged. Despite the weekend's chorus of how the devil is in the details of the plan and why the plan won't work, European stock markets continued to rise on Monday. This begs the question: Are market expectations too low? As I wrote last week, read the market reaction, not the Summit statement. Consider the case of how the market is reacting out the story on China and the possibility of a hard landing. On the weekend, Barron's published a cover story called Falling Star, summarized by the subtitle "The Chinese economy is slowing and is likely to slow a lot more. Get ready for a hard landing." After three decades of annual growth averaging 10%, China's bullet-train economy is slowing markedly. Economic problems in Europe and the U.S. are stunting export growth, long the primary driver of China's economic miracle. Growth in industrial production has likewise been decelerating for months. This year growth in gross domestic product could slip to 8%—and it may get a lot worse from there. Though recently announced interest-rate cuts and a ramp-up in the government's already massive infrastructure spending could postpone the day of reckoning, to us it looks like the Great China Growth Story may be falling apart. For those without a Barron's subscription, Josh Brown has a good summary of the article here. Overnight, both China's official PMI fell to 50.2 from 50.4 and the HSBC manufacturing PMI fell to 48.2, indicating weakness. What did the market do in the face of all these negative stories? The Shanghai Composite ended up flat on the day Monday and rose on Tuesday. In my last post (see Can China hold things together? ), I pointed out a number of extreme risks that are not outlined in the Barron's article, but current market conditions indicate few signs of financial stress. As the sun rose on Monday across the globe, individual country PMIs were reported and the reports were generally punk. Contraction, rather than expansion, was the word of the day. As the US market opened, the Markit US PMI came in weaker than expected and ISM missed with a 49.7 reading, compared to market expectations of 52.0. Ed Yardeni has a good post summarizing the broad nature of the slowdown. He cites initial unemployment claims, durable goods orders, regional business surveys, consumer sentiment and consumer spending as sources of economic weakness. Treasuries rallied hard on the news of economic weakness, but stocks ended the day flat. Announcements of a housing recovery have become a wrongheaded rite of summer, but after several years of false hopes, evidence is accumulating that the optimists may finally be right. The housing market is starting to recover. Prices are rising. Sales are increasing. Home builders are clearing lots and raising frames. 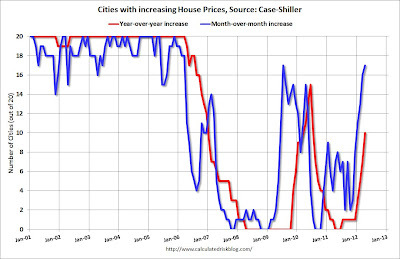 Calculated Risk also pointed out that the number of cities with increasing prices were on the rise. What's going on? Is the American economy tanking or recovering? If housing is indeed recovering, or even stabilizing, it would provide the underpinnings of a bullish impulse for stocks. The New Deal Democrat has an insightful post where he believes that housing is shaping up to be the stealth (bull) story of the year. Friday's NFP release will be one of the first acid tests of the bull/bear debate on the US economy. The consensus expectations for this month is 80K, which seems very low to me. Gallup does a daily survey of the employment situation, which suggests that while the raw unemployment rate will be unchanged from last month, the seasonally-adjusted unemployment rate will fall. If I were a betting man, I would take the "over" bet on NFP this Friday. If I am right, it would mean another relief rally because market expectations have been racheted down too low. Don't get me wrong. My inner investor continues to be very nervous about the macro backdrop. The global economy is weakening. Europe just kicked the can down the road by a few weeks and Greece will undoubtedly fall apart again before the end of 2012. I am also concerned about the tail-risk of a black swan event coming out of China. My inner trader is telling me that we are poised for a relief rally on any form of good news, largely because expectations are too low. Enjoy the party but stay close to the exits. Can China hold things together? The Zhejiang government is scrambling to settle a credit crisis threatening banks and financial institutions that altogether issued about 6 billion yuan in loans to scores of companies. Sources say 62 companies, from furniture makers to import-export traders, have been affected to varying extents by the collapse late last year of Hangzhou-based property developer Tianyu Construction Co. Ltd. The companies were financially linked to Tianyu through a province-wide, reciprocal loan-guarantee network. Tianyu’s sudden failure raised the specter of a domino effect of defaults taking down every network participant and devastating their lenders. The finances of China’s county-level governments are unstable and unsustainable as the majority of their fiscal income comes from sources other than taxation, the nation’s top auditor said. About 60 percent of revenue raised last year by 54 counties investigated by the National Audit Office wasn’t derived from taxes, Liu Jiayi, the head of the agency, told a meeting of the legislature yesterday, according to a transcript of his speech on the audit office’s website. Total fiscal revenue at those counties rose 17 percent to 112 billion yuan ($17.6 billion) last year, Liu said. The Chinese economy appears to be slowing. With stories like this one from the FT about Chinese officials forced to sell cars, cracks are appearing all over and a shadow banking systems that appears to be teetering, can China hold things together? 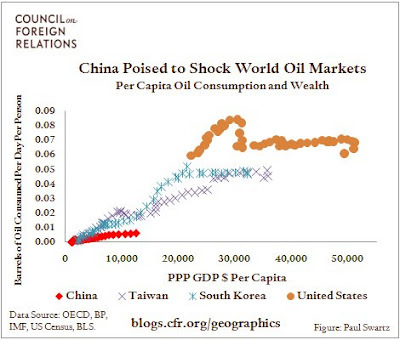 The problem with China is that it's very opaque and economic statistics are unreliable. Outside investors have no idea of the size of the problem and therefore cannot gauge the impact of any problem. What we have left are anecdotes the like ones above that can be highly alarmist. Similarly, the AUDCAD cross is showing signs of a turnaround. This exchange rate is important because while both the Australian and Canadian economies are commodity sensitive, the Aussies are more levered to China while the Canadians are more tied to the American economy. 1) China's IP data published by the National Bureau of Statistics (NBS) only covers companies with annual revenue of more than RMB20m. Given that most heavy manufacturing firms (which perform worse than the overall economy due to the ongoing investment-led deceleration) are medium and large in size, the NBS tends to exaggerate the growth deceleration. 2) Direct electronic reporting of production data (from companies, rather than from local governments) to the NBS was implemented gradually from end Q1 this year. If there was a reason to believe local governments tended to overstate IP and other economic activity data under the old system, then the implementation of the direct reporting requirement should lead to an understatement of yoy IP growth in April and May (as there is now less over-reporting compared with a year ago). Such developments must be regarded as being encouraging for the bulls.